2 Major Randomized Controlled Trials demonstrating benefits of leading iVascular products have been presented at Euro PCR 2018. 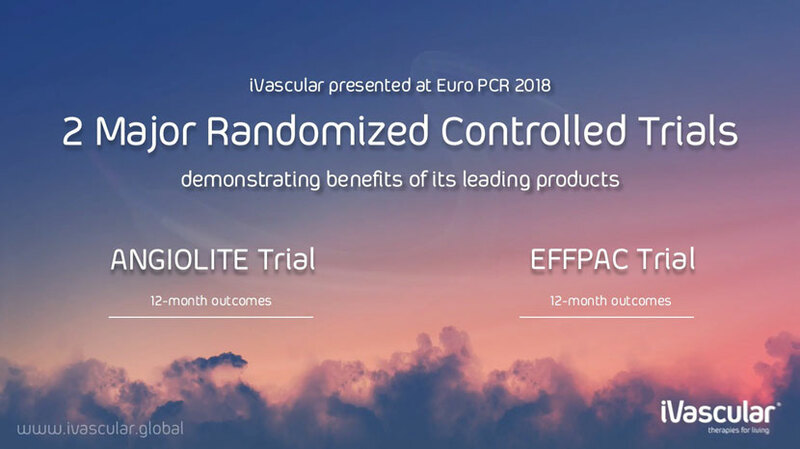 Paris, May 24th, 2018 – 2 Major Randomized Controlled Trials demonstrating benefits of leading iVascular products have been presented at Euro PCR 2018. Dr Moreu Burgos and Prof Ulf Teichgraber have shared the latest 12-month results of ANGIOLITE and EFFPAC RCTs in Paris, during the “Clinical outcomes with new DES” and “Hotline Peripheral and Stroke Interventions” sessions. ANGIOLITE trial is a randomized prospective multicentric controlled trial that enrolled 223 patients with the objective of demonstrating non inferiority versus Xience DES. 0.014 mm Late Lumen Loss at 6 months. 5.4% Target Lesion Failure (composite endpoint) at 12 months. EFFPAC is a randomized prospective multicentric controlled trial that enrolled 173 patients and clearly demonstrates the superiority of Luminor DCB versus POBA in femoropopliteal lesions. Beyond meeting all endpoints, EFFPAC also highlights that Luminor DCB is the only DCB proving statistically significant improvement of patients’clinical status.